So you told your coach your bicep hurts and been told good, nothing to worry about. Wait, watch and learn how to stay healthy! The Florida Baseball Ranch mission is to help every player get to a level of play at least one wrung above where you could have gotten if you had never met us. Whether you’re a youth player trying to make a travel team, or a professional player trying to ascend to MLB all-star or even Hall of Fame status, or anywhere in between, we believe that if we can help you get one level beyond. 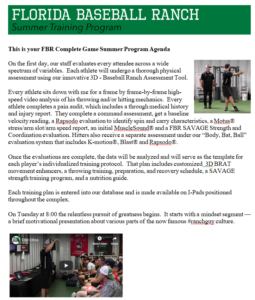 Below Are Our Baseball Training Programs For Pitchers & Hitters. Please Call 866-STRIKE3 For More Details Or To Book! Please Call 866-STRIKE3 For More Details Or To Book! Free 30-Day Membership to Our DURATHRO Training System (Online-Vault of Video’s, E-Books, And Other Services To Ensure Complete Continuity in Your Training). If you’d like to receive more information about our incredible Weekend Elite Performance Boot Camps, complete with specialized pitching lessons and hitting lessons, click here and we’ll mail it to you right away. improve command and get rid of that arm pain once and for all! Click Here to continue reading.